There are still many paranormal investigation websites that show photos of orbs as evidence of paranormal activity. Orbs can appear in videos (see note below) and still photographs, and some people still claim that they are an early stage of spirit manifestation. We generally disagree. Why is it that these 'orbs' only show up in photographs? You don't actually see them. If they were little bundles of energy floating around, they would be just as visible to the naked human eye as to the camera. Actually, it is often only cameras with a flash positioned close to the lens that show up orbs. If the flash doesn't fire, no orbs. And orb photos are more common with digital cameras than film. This is not because of the digital recording device, but the compact optical design of the cameras, the short focal length and small aperture of the lenses and the close proximity of lens and flash. The photographic terms for this effect are backscatter and near-camera-reflection. Lately I have been using an DSLR digital camera with a large flash that sits up about 20cm above the lens. 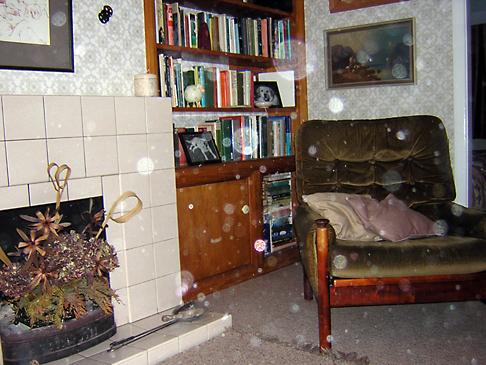 In a room where a compact camera photographs orbs (dust), the SLR shows nothing. This is because the dust particles that are close to the flash are actually way above the lens, out of its coverage area. You will also see orbs drifting across in video footage, but usually only when there is a light source (Infra Red or visible) situated close to the video camera lens. In the case of IR surveillance cameras, the IR LEDs surround the lens. These will show up-close dust particles as 'orbs'. Contributing factors include the JPEG file compression employed by most compact cameras and the application of digital sharpening in the camera. These processes, as well as the optical quality of the lens, enhance colours and patterns "within" the orb, making them seem more than what they are: that is, specular flash reflections of the highlights of airborne motes. This diagram shows how illuminated dust particles close to the lens render as larger circles at the image plane. Out of focus points appear as Circles Of Confusion (COC) where they hit the imaging sensor or film, and this image is the orb you see in the photo. If an orb in a photo is none of the above and is not from any other discernible natural or man-made source, then it may be supernatural, a spiritual energy of some kind. But you need to go through the entire process of elimination to reach that conclusion, which still should not be regarded as absolute. It may, however, add up with other evidence collected at a site to the possibility of paranormal activity. I have seen a lot of photos where there is a person 'pointing' at an orb, which seems to imply that the person could actually see or detect something in the vicinity of the photographed orb. Actually, because photography reduces the world down to the two dimensions, it is not possible to tell how far from the camera the orb is. There is almost never (in the case of dust orbs, at least) any spatial clues. In most cases, the person will be pointing at something in the middle or far distance and the dust orb will be mere centimetres from the camera! Actually, I said above that you don't actually see the orbs. Well, here's an experiment you can try safely at home: try stirring up some dust from a cushion or something then fire a camera flash in the cloud of dust. You will briefly see the dust near the flash lit up, and it will appear in the photo. Voila, orbs! We have had a lot of enquiries about orbs appearing in videos. Video cameras usually have LED illuminators sited close to the lens, and these can catch floating particles of dust, moisture droplets and small insects in a similar way to the flash of a still camera. The main difference is, of course, movement. We use infra-red DV cameras on our investigations, and these have multiple IR LEDs positioned in a circle with the lens at its centre. We often record floating orbs using this setup, usually caused by dust stirred up by passing humans, which appears as orbs up to several minutes later, or completely randomly. Sometimes the orbs have a flight path that makes them appear to follow people; but, as with still-photo orbs, they are really much closer to the camera than they seem. The apparent size of the orbs, and their flight paths, is an illusion caused by the compression of 3D visual space down to 2D. Usually there's nothing paranormal involved, but that doesn't mean we take things for granted and don't bother to check! The Paranormal encyclopedia has a good article on Orbs, as does ASSAP in spades.